Our Play Room is coming along nicely and I wanted to show you a little of what we've done so far. There's lots more to come! Above Left: The modified dentist's chair in our new Play Room - a generous and much appreciated gift from good friends in the far north. 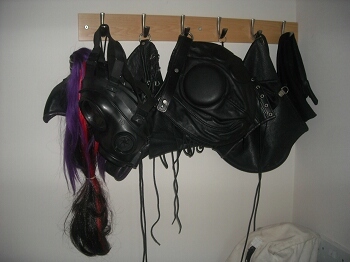 Above Right: Head harness, chest and biceps straps. The backrest is adjustable to whatever angle may be required. Above Left: Hip/thigh strap, height adjustable stirrups and ankle restraints allow for interesting variations. Above Right: Stirrups in use. Above Left: Head harness over maxi's favourite semi-isolation helmet. 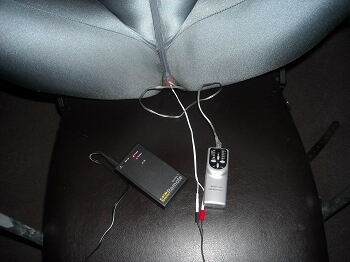 Above Right: Rear view of the head harness - note the chair's built-in electrical connectors. Above Left: The combination of e-stim and vibration demands the security of heavy duty restraints! Above Right: The leather straps cope easily with maxi's reactions to the electrical play she must endure. Above Left: A general view of the play room with the white box on the right being a soon to be modified massage table. 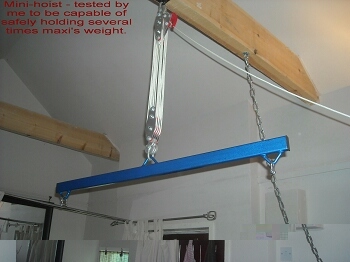 Above Right: A mini hoist, thoroughly tested by me and capable of safely holding several times maxi's weight. Above Left: Gear One. Above Right: Gear Two.